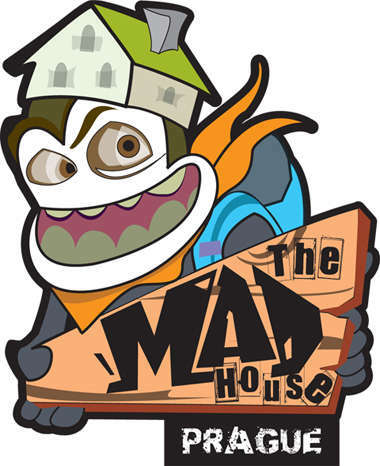 At the Madhouse, you’ll find a spacious kitchen perfect for hostel family dinners or afternoon beer-pong sessions. The kitchen is also the place to meet each evening for pre-gaming and drinking games before we take the party out of the hostel to the some of Prague’s best bars and clubs. There are daily activities led by our awesome, international staff from beer garden outings to family dinners to nightly shenanigans out on the town. Set up like a big house shared with 40 of your newest best friends, highlights include a two-tiered, theatre-style TV lounge set up precisely for your ultimate comfort that is set up with sofas, bean bags and a hard drive full of movies for all you lazy travellers needing a well-deserved break from sightseeing or for those who just can’t shake last night’s hangover. We also have WIFI throughout all rooms and common areas as well as free desktop computers for you to use. 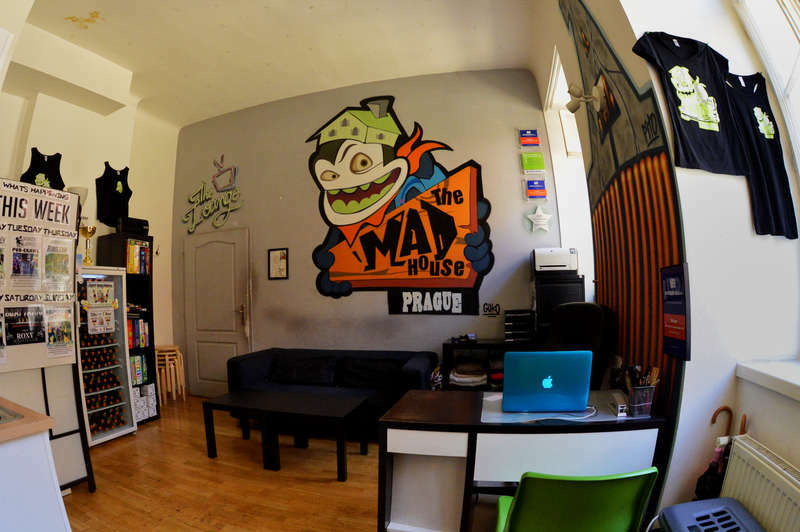 The entire hostel was custom painted with amazing graffiti artwork throughout by good friends from Montreal, Canada – Pito and Guko – and another mate from Melbourne, Australia – Dan – making The MadHouse a truly unique and spectacular hostel to stay at. 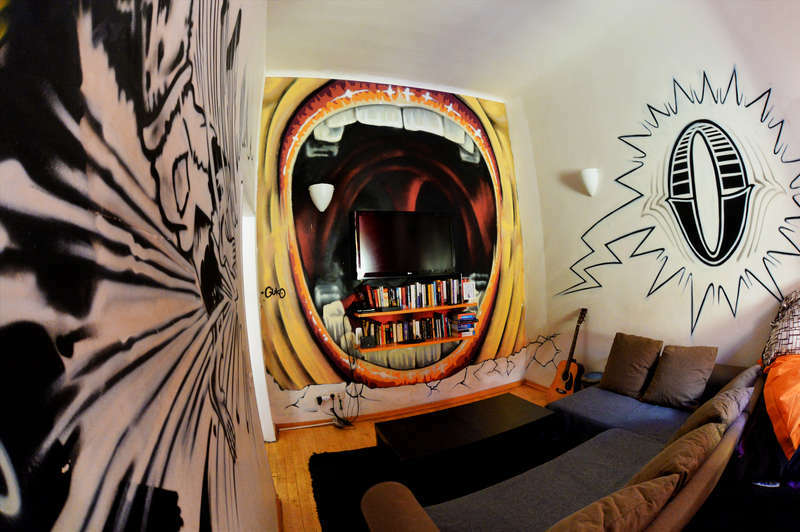 Come check us out and let us show you the MAD side of hostel life in one Europe’s most beautiful and debaucherous cities. Great stay with amazing staff, always making people feel welcome and part of the hostel family. Extremly clean and organised for a party hostel. Easy to meet other people. Feels like a home from home. Take bus 100 to metro station ‘Zlicin’ and from there take the Metro Line B (yellow) to ‘Narodni Trida’. At the top of the escalators when you exit the station, cross the street and take the small street to the left of the Relay store. OUR ENTRANCE DOOR IS THE FIRST DOOR ON THE LEFT, OSTROVNI STREET 34. You will need a 32 CZK ticket that can be bought in the airport arrival area or with coins at the ticket machines near the bus stop. When you exit the train station, turn right and walk 2 minutes through the park to the tram stop. Cross the tram tracks and take tram 9 for five stops to ‘Narodni Trida’ After you get off the tram, cross the tram tracks and walk left and take your first right down Ostrovni Street. OUR ENTRANCE DOOR IS LOCATED ON OSTROVNI STREET, NUMBER 34 (first door on the left). You will need a 24 CZK ticket that can be bought in the station or with coins at the ticket machines near the tram stop. Take metro line B (yellow) for three stops to ‘Narodni Trida’. At the top of the escalators when you exit the station, cross the street and take the small street to the left of the Relay store. OUR ENTRANCE DOOR IS THE FIRST DOOR ON THE LEFT, OSTROVNI STREET 34. You will need a 24 CZK ticket that can be bought at the metro station. Cancellation policy: 48 Hours advance notice. If you need to cancel your booking, please email before 12:00 at least 2 days before your arrival date (for example if you booking is for Friday, you must cancel before 12:00 on Wednesday). We are ideally suited to solo travelers or small groups who wish to mingle and meet people. Therefore, WE DO NOT ACCEPT BOOKINGS FOR GROUPS LARGER THAN FOUR PEOPLE. If you choose to make a booking for your group, we reserve the right to cancel your booking without a refund of your deposit. This policy also applies to multiple bookings under different names for the same group. If you arrive at the hostel in violation of our group policy, we have the right to cancel your booking on the spot without refund of your deposit as well as charging additional cancellation fees in the amount of your group’s first 2 days accommodation.